Hey guys! I am back with another post that was rather popular on my Instagram feed. 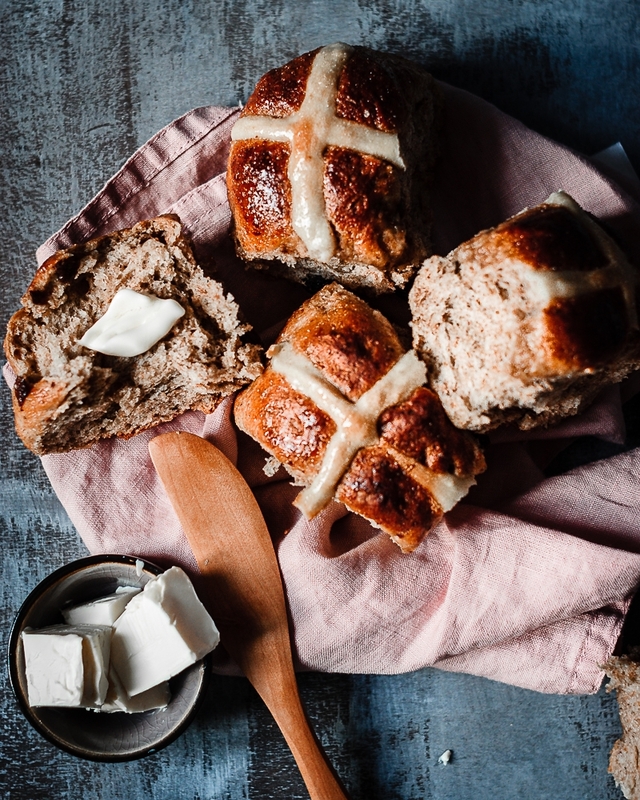 Today I share a recipe for fluffy, soft, and aromatic Hot Cross Buns. These lovely rolls aren’t a thing in Germany at all and I first saw them years ago when I started to read English vegan blogs. I’ve always wanted to veganise them but every year I forgot. So now it’s finally the time! Usually I am very confident with recipes like this. 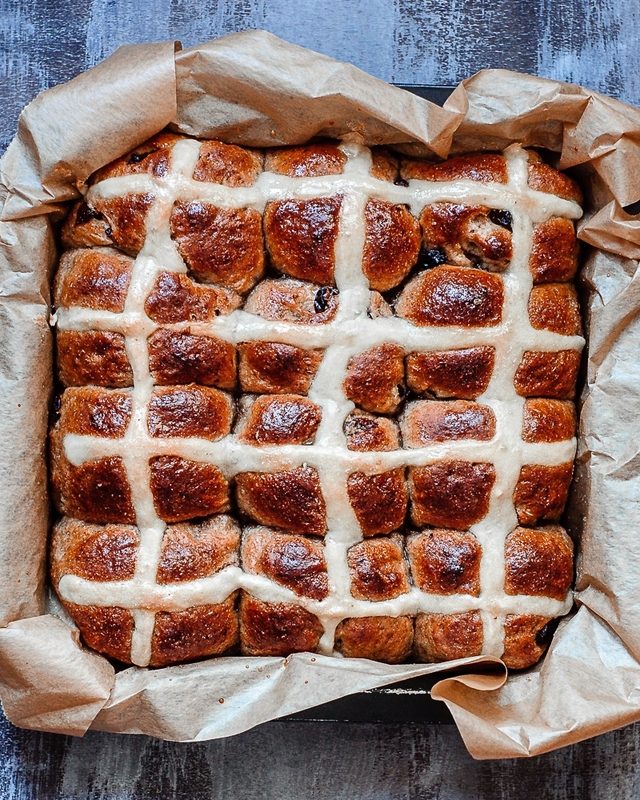 Hot Cross Buns are made from an enriched yeast dough and after all these years of baking I can make this kind of dough in my sleep. 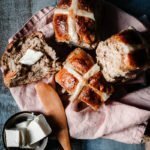 With these buns I wasn’t quite so sure because I have never tasted them before! I guess that’s why I went a bit overboard and soaked my raisins in whisky and added chai spice to the dough. I was very happy with the result! Even though I used mostly whole spelt flour, the buns came out so soft and fluffy! The whisky goes very well with the chai spice. If you don’t like alcohol, you can soak the raisins in apple juice. Also, these can be frozen right after baking and if you thaw them they are still light and fluffy. You don’t have to reheat them. By the way I just celebrated my 12 vegan anniversary, which also means that the blog has been here for 12 years! What a different time that was. Vegan blogs were few and we basically all knew each other. I spent a lot of time on here, to post recipes and write down stories that belonged to those recipes. I also read a lot of other blogs and found the community very helpful, especially from a German perspective. With the help of an international community veganism stuck and I learned so much about baking and cooking. And I found Hot Cross Buns. Combine raisins and whisky and soak for several hours or overnight. Drain raisins and set aside. For the buns, combine flours, salt, and sugar. Add milk and yeast and let sit for 5 minutes. Knead the dough for about 5-7 minutes. Add margarine, spice and raisins and knead until everything is completely incorporated. A couple of raisins will fall out of the dough. That is okay. Cover the dough and let rise in a warm place for about 1 hour or until it has almost doubled in size. Preheat the oven to 200°C and line a 20 x 20 cm baking pan with parchment paper (or grease it). Divide the dough into 12 equally sized pieces, roll into balls, and place them in the pan. Cover and let them sit for 30 minutes. Combine all ingredients for the crosses and place the paste in a pastry bag with a round tip. Pipe crosses onto the buns and place baking pan in the oven. Combine sugar and water for the glaze and brush the hot buns with the glaze.